United Company Rusal, Russia’s aluminium monopoly, lost a prop for its sale revenues, debt repayments, and share price this week, when the UK Court of Appeal allowed a new aluminium stocking rule by the London Metal Exchange (LME) which Rusal has been opposing since July 2013. 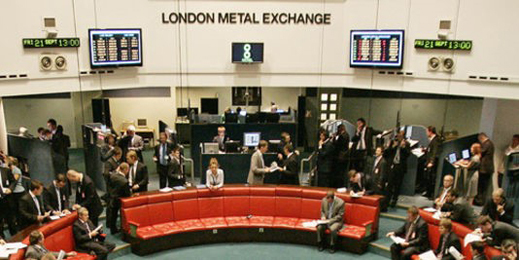 The LME aims to end over-stocking of aluminium in warehouses, and cut the premium Rusal charges for customer deliveries on top of the LME contract price for the metal. That rising premium has been worth 20% of the aluminium spot price, according to the latest Rusal figures to June 30. This amounted to $319 million of Rusal’s aluminium sales revenues in the second quarter of the year. Cut the premium in half, or remove it altogether, as aluminium market regulators in London, Hong Kong, and Washington have been trying to achieve, and Rusal would be producing aluminium at a loss; its second-quarter profit of $129 million — its first positive bottom-line in two and a half years — would be wiped out. 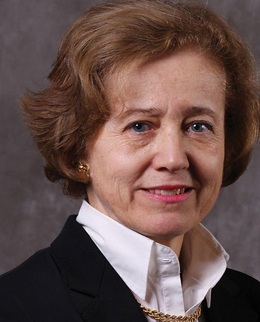 A three-judge panel of the Court of Appeal ruled on October 8 to overturn a High Court judgement in Rusal’s favour, issued six months ago on March 27. The new judgement was written by Justice Dame Mary Arden (right); concurring were Justice Sir Richard McCombe and Justice Dame Elizabeth Gloster, defender of Roman Abramovich in his 2012 High Court victory over Boris Berezovsky.The full text of the new ruling can be read here. 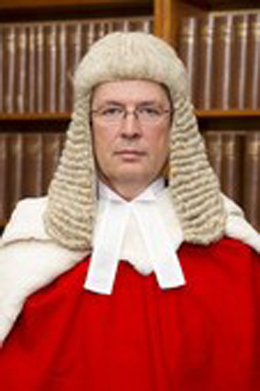 In March High Court Justice Stephen Phillips had decided that introduction of an LME rule to accelerate movement of aluminium in and out of the warehousing system had been unfair to Rusal. The text of his judgement can be read here. The LME publishes aluminium stocking data for the warehouses it covers in the global market. According to the latest evidence, stock levels have been falling since the start of the year. 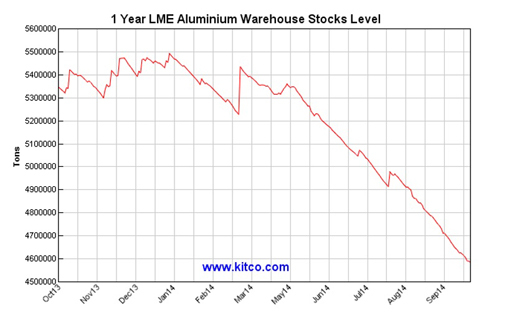 But these data do not reflect an accurate picture of aluminium stocking outside the LME’s means to monitor. Also, precisely how much aluminium Rusal produces, sells, and with Glencore, a shareholder and prime trader, keeps in unsold stockpiles, is also unmeasured by the LME, and unreported by either Rusal or Glencore. 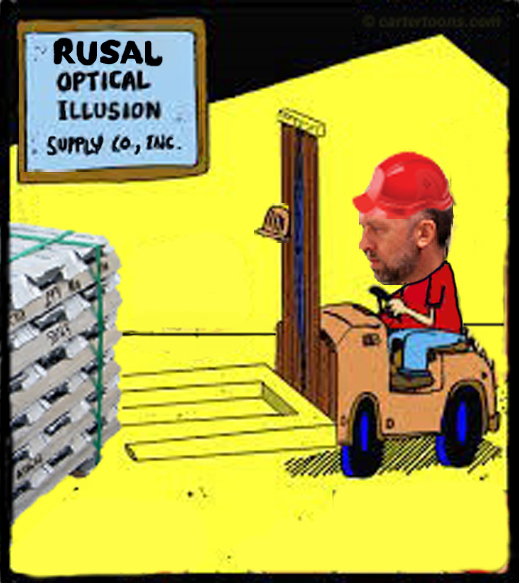 The story of Rusal’s hidden aluminium can be followed here. The attempt to make the aluminium market more transparent, and stop price-rigging by producers and traders, as well as the international banks controlling the warehouses, can be read here. Last year’s US media campaign to expose the aluminium warehouse premium, and reform the warehouse stocking and pricing rules, didn’t mention Rusal or Glencore. Sponsored by American drinks companies, whose beverage cans are made of aluminium, the lobbying targeted Goldman Sachs and JP Morgan. When Reuters attempted to probe and publish the role of Rusal and Glencore, it received a defamation lawsuit threat from a London law firm. The Court of Appeal explicitly recognizes that as market demand for aluminium has been falling, Rusal’s interest is in keeping the uncertainty of supply up. So the rise of the warehouse premium has helped offset the decline of Rusal’s revenues from sales at the purported market price. The effective price for Rusal was the LME spot price plus the premium. The proposed LILO rule, to which Rusal objected, requires that the amount of new metal which a warehouse, having a queue of more than 100 days, could accept (‘load in’), would be restricted and tied to the amount which it had delivered (‘loaded out’) – hence LILO. The Arden ruling will not be appealed, Rusal has announced; the LME says it expects to start the new rule on February 1, 2015. In the first day’s trading after the court ruling was announced, Rusal’s share price dropped 1.9% to HK$4.08 (53 US cents). Its market capitalization is now the equivalent of US$8 billion. Rusal’s share price had started falling from September 12, just as the spot price for aluminium started downwards; well before the market could guess what the Court of Appeal would rule, or when. Rusal’s year-to-date peak has been HK$4.76. It’s now down by 13%. 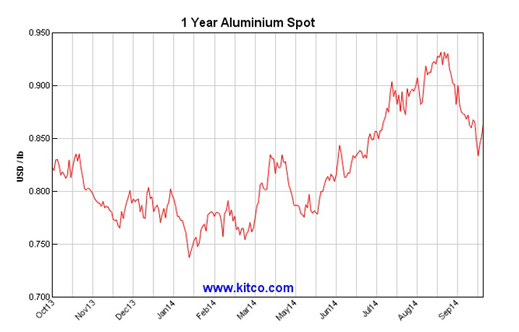 The price of aluminium has fallen 9% over the same interval. This morning the spot price is US$1,885.50, and falling. The 3-month future spot price is $1,916, and also falling. The market is showing no confidence that conditions for aluminium pricing are as “fundamentally different” as Rusal has declared. The judgement of the Court of Appeal upsets the upside.